Tammy and I watch a lot of TV and there are a few shows that we wouldn’t mind being on, like Big Brother, The Glass House, Bath Crashers, and House Crashers, just to name a few. You’ll never see us on this show. But one show we have decided we do NOT want to be on is HGTV’s House Hunters. 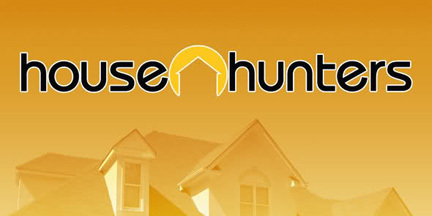 Each 30-minute episode of House Hunters shows “individuals, couples and families” looking at three homes that fit within their budgets and specs. The end of each episode shows the which house of the three was selected. When we started watching the show I couldn’t help but think how cool it would be for us to be on it. It’s be awesome because it would mean we had sold our house and were moving someplace else. But it didn’t take many episodes before I started getting angry at the people looking at the houses. It seemed no matter how nice the house was they were ALWAYS finding something wrong it. I don’t like the carpet. This room is too bright. There are too many stairs. I don’t like my clothes touching other clothes. The drive is too far. It wasn’t easy breaking the news to Tammy that I didn’t want to be on the show. Me: I don’t want to be on House Hunters anymore. Me: Because I don’t want people to hate us. Me: Every time we watch the show I end up hating the people on there and their stupid reasons for not liking a house. I don’t what people to hate us, well not for that anyway. Plus, I know we’d never have all of our stuff unpacked when the TV crews come back to visit. Sometimes it’s three weeks, sometimes it’s three months but regardless of when it they would arrive we wouldn’t be ready. Gallery | This entry was posted in Daily Life and tagged daily live, house hunters, humor, Tammy, television, TV. Bookmark the permalink. I think the name of the show was “Designed to Sell.” I’m not sure it is on any more. I don’t think I’ve seen that one (can’t rule Tammy out) but I have heard that some of the stuff is staged. And from the comment below, it appears that even House Hunters is too!! I think you guys would make a perfect couple to go on the show. A bit of sarcasm and wit will make for perfect television. Yeah, but I’m afraid they wouldn’t like all of the bleeps they’d have to put in. Tammy: What the bleep is this bleep? Seriously? It looks like somebody bleep all over the bleep-ing floor. Hahaha…The Hubby says I curse way too much. But you gotta love a dirty mouth! You guys would be perfect! But, yeah, I had a friend whose house was featured on there – after the woman had already picked her house. So the whole acting like she loved the house and might pick it was completely faked. That’s funny about the part of not being unpacked yet. I could totally see that happening to me, too. That’s interesting that they made someone look at a house AFTER they’ve already picked on. I’ve often wondered how many houses the people ACTUALLY look at before it gets cut down to the three we see on TV. I know, that’s what irks the crap out of me. I don’t care what color the walls are or even the carpet to that extent. Does it check off enough of my boxes (number of rooms, room size, bathrooms, etc.)? That’s more important. But I do wonder if the show makes the people say some of the stupid stuff. Like the one we watched last night (had it recorded) and the guy was saying he like that the TV was mounted to the wall but didn’t think his TV would fit. I was thinking he must have a giant 70-inch TV or something… Nope. It was just a little bigger than the one on the wall. I was yelling at the TV when I saw it!!! *I love to watch House Hunters International….